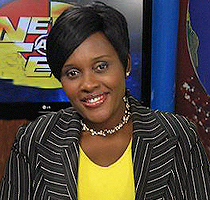 Ijeoma Onyeator, an experienced TV Presenter and reporter, was born in Nairobi, Kenya. distinction in Media, Communication and Technology from Brunel University, Uxbridge in the United Kingdom. it it worthy to note that at Unilag, she was the best graduating student of the Mass Communication Department. She is an associate member of the Advertising Practitioners Council of Nigeria. She worked with shell Petroleum Development Company of Nigeria and Heritage Oil and Gas where she garnered a lot of experience in Public Relations and Advertising and trained as a Media Officer. However, in pursuing her career, she joined Channels Television in January 2004 as an anchor, presenter and reporter. Ijeoma Onyeator has since become a force to recon with in the industry as she is an outstanding media professional and currently anchors Channels Television’s flagship bulletin – The News at Ten. She is happily married and blessed with 4 children. She has as her hobbies playing scrabble, solving crossword puzzles and playing chess.